Files sync can help people make a copy and work in different places more convenient. 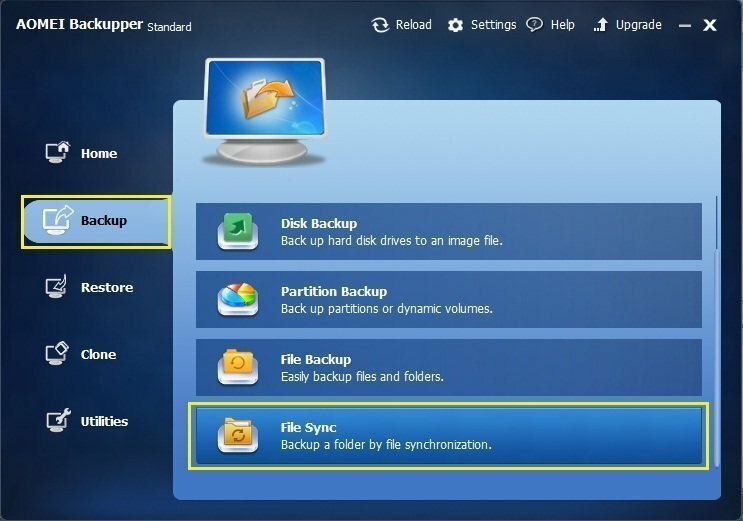 Here you can learn how to sync files in windows 7 computer with AOMEI Backupper. Scenario: I have seen a situation before - a user sometimes does his job at home and sometimes at office. Thus, his files were changed so that he must update the data on both sides every time, which made him very upset. Sync (short for synchronization), which is an operation that can keep files in multiple locations up-to-date. That is to say, sync file is going to keep two files or more stay the same and keep the newly-created or updated files and folders from the source directory to the target directory. In other word, sync file is a kind of backup in a certain way. Most of us know that we need to backup system before the system crash or the data broken. 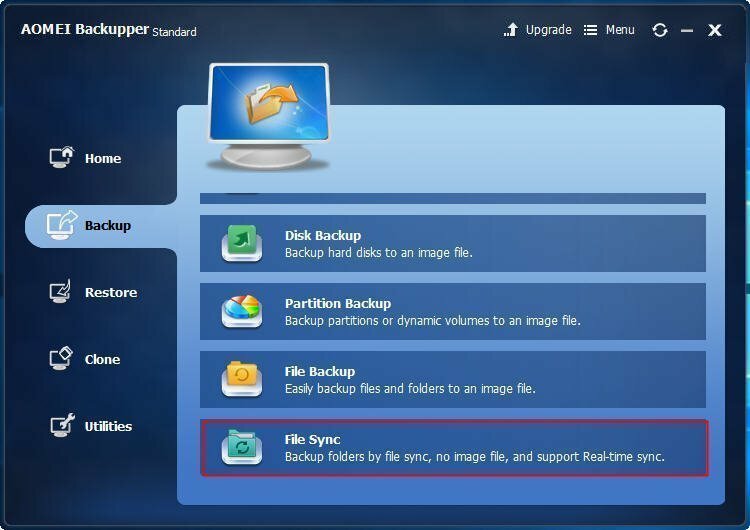 The file sync is a function that can synchronize many files or folders so that we can’t worry about the update times any more like the scenario no matter for Windows 7 or other OS. The files can be synchronized to the local space or the different PCs though Network and we called the single file synchronization or remote file synchronization. When doing sync file, it will scan the files of both folders and compare with the source directory to find the changed files, then, transmit the needed files or delete the needless files to keep the files sync. For Windows 7, setting up file sync is easier than Windows operating system before. Windows 7 has the function to synchronize files called Sync Center. Click the “Start” button> “All Programs”> “Accessories”> “Sync Center” to open the Sync Center. So you can set sync as you want. Sync Center in Windows 7 is designed to help you sync with files in network locations. If you want to sync a mobile device with the computer, Windows gives you several other options. You can find the third party software to do it. Compared with other software, we recommend AOMEI Backupper Standard, the free sync files software with multiple powerful functions. The operations are easier than Windows 7 built-in’s, and it only needs two steps you can finished sync. Step1. Download, install and launch AOMEI Backupper Standard edition. Click “Backup” and slide the bar to select “File Sync”. Step2. Open the “File Sync”, you will see the interface like the following picture. Click “Add Folder” in the “Step1” to select the files you want to synchronize before. Click the “step2” to choose the target directory where you would like to put the files in. Then, click the “Start Sync” to proceeding. After the two steps, the sync files have been finished yet. But if you would like to do more job for it, you can click the “Sync Options” to set up more specific details, or click the “Schedule Off” to set up automatic sync, such as daily, weekly, monthly and event triggers. AOMEI Backupper can only support one-way sync file. It cannot synchronize files or folders to CD/DVD/Blue-Ray. It cannot synchronize single file to FAT/FAT32 whose volume is more than 4 GB, because FAT/FAT32 only supports single file volume up to 4 GB. Event triggers is a great function which contained in AOMEI Backupper Professional, which is more powerful than AOMEI Backupper Standard. You can also use the Professional to real-time sync folders to network, which cannot be finished with Standard. Download the 30-day free trial to experience now! 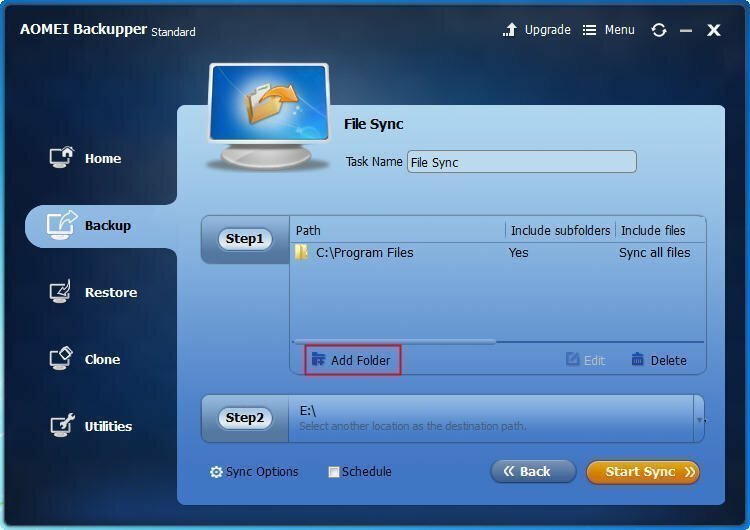 If you still have questions on how to set up sync file windows 7 by AOMEI Backupper, you can see more details by reading How to Use Free File Sync in AOMEI Backupper.